It is a mitzva for a Jew to marry and to live together with a spouse in a manner worthy of the traditional Hebrew designation for marriage, kiddushin, (to set apart for each other in a sanctified relationship). In Judaism, the decision to marry implies a willingness to enter wholeheartedly into a sacred covenant with another person. Note: All newly married couples will be invited to join our congregation on a complimentary basis for the first year of their marriage. Traditional Judaism forbids weddings during the three weeks between the 17th of Tammuz and the 9th of Av (a period usually in July or August) and during the period from the second day of Pesach until Shavuot. However, Reform practice is lenient with respect to both these periods. The religious aspects of the wedding service will be greatly enhanced if it takes place at the synagogue. Before any final plans are made it is important to set the date, time and place with the officiating rabbi. The rabbi will meet with the couple several times prior to the ceremony. On a Shabbat prior to the wedding the bride and groom will be called to the bima for special blessing. Traditionally, as the bride and groom leave the bima, they are showered with sweetness (soft candy) by the congregation. Schedule the aufruf in consultation with the rabbi. A civil marriage license must be obtained prior to the wedding ceremony. Please contact the clerk’s office of the county in which you reside for the requirements in your county. If you are coming from out of state, contact the clerk’s office of the county in which the ceremony will occur. The Jewish marriage contract must be signed by two witnesses. These witnesses should be Jewish and not related to the bride or groom, or related to each other. It will be helpful if they know their Hebrew names. The rabbi can be of assistance. The rabbi will also be helpful in formulating plans for the wedding ceremony. The cantor usually joins the rabbi in officiating at the wedding ceremony. The essence of the ceremony is in the wedding vows which are spoken both in Hebrew and in English by the bride and groom as the wedding rings are exchanged. Photographs and videos may be taken during the signing of the ketuba, processional and recessional. Once the ceremony begins, no still photographs may be taken. Video may be taken using natural lighting, as long as the videographer is out of the line of sight. When the service is in the sanctuary, the congregation will handle videotaping the ceremony through video cameras built into the sanctuary and directly connected to the sound system. On request, pictures may be posed before or after the ceremony. 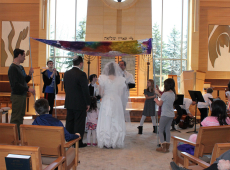 It is important to consult with the rabbi and cantor concerning appropriate music for the ceremony before making a commitment to instrumentalists or singers. We encourage the use of music which is of classical Hebrew or Israeli origin. The executive director will be happy to give you information about the use of synagogue facilities. Our clergy seek to support interfaith families, guiding and counseling couples before, during, and after the ceremony. While they appreciate the importance of the wedding ceremony, our clergy wish to help these couples recognize that the ceremony is one step in their relationship with each other and their developing relationship with the congregation. Our clergy will also be able to help partners find creative ways to solemnize their relationship. Our clergy may officiate at interfaith weddings for members of the congregation as well as the children of members because many children who grew up in the congregation have deep and strong bonds with our clergy and seek their presence at such times. Our clergy may officiate at such wedding ceremonies with the understanding that the ceremony would not take place within the synagogue; that the ceremony would be religious (e.g., using language common to many faiths, such as talking about God) but not specifically Jewish; and clergy from other faiths would not be allowed to co-officiate. Weddings ceremonies will not begin before the end of Shabbat. Couples wishing to be married on a Saturday evening will be encouraged to consider alternative pre-ceremony celebrations (e.g. cocktails, hors d’oeuvres, dinner, Havdalah) to ensure that the wedding ceremony begins after sundown. Our clergy will officiate at all wedding ceremonies under the same set of guidelines as described above. Couples considering divorce are advised to seek out the rabbi, who can counsel with them or direct them to a professional counselor to help them with their differences. Perhaps with help a couple can remain married to each other. If not, Judaism has allowed divorce from earliest times. While traditional Judaism requires the obtaining of a religious divorce decree before a divorced person may remarry, the decision as to whether or not it is advisable to obtain a get should be made in consultation with the rabbi.